Swaziland’s HIV epidemic is one of the most extreme in the world—the country faces a 26 percent HIV/AIDS prevalence rate in the general population, with almost half (45 percent) of all children orphaned or vulnerable due to the pandemic. The HIV/AIDS epidemic, alongside other health, economic, and social challenges, has put a significant burden on the health and social welfare sectors. Swaziland also suffers from a severe workforce shortage, with fewer than two healthcare workers for every 1,000 citizens, many Swazi doctors having left the country for better working conditions abroad. Constraints in human resource capacity are identified in all key national health and social welfare strategies as a major hindrance to the HIV/AIDS response and the delivery of basic health and social services. In support of PEPFAR’s shift to focus scale-up of resources and services towards communities and health service delivery sites with moderate and high yield of HIV/AIDS patients, HFG’s activities are primarily targeted at better data gathering and usage, to manage the human resources in the country. 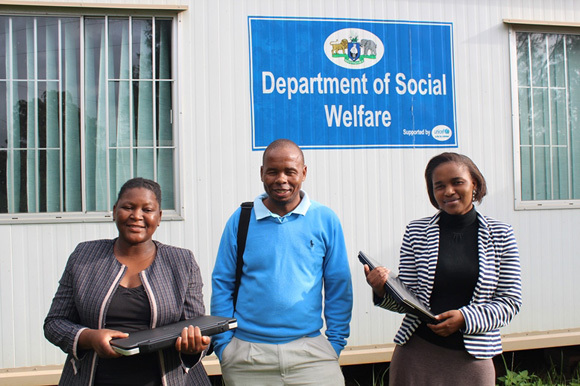 Through these activities, HFG is assisting Swaziland’s Ministry of Health (MOH) and Department of Social Work (DSW) to reduce the disease burden and mitigate HIV risk via improved social welfare systems in Swaziland’s most under-resourced region. One of HFG’s key intervention areas in Swaziland is the development of human and institutional capacity to manage an effective HIV response. HFG’s work aligns with the PEPFAR 3.0 Human Resources for Health (HRH) Strategy (2015) which emphasizes the importance of: assessing the human resources requirements for service delivery in priority areas; implementing recruitment, deployment, and retention strategies; establishing sustainable financing for health workers; and improving performance. To support implementation of the HRH strategy in Swaziland, HFG determined the human resource requirements for meeting PEPFAR service delivery targets, and provided recommendations to implementing partners for increasing the efficiency of the workforce. HFG also worked with the Swazi government to establish standardized hiring and compensation policies. Central to the recruitment, management, and retention of health workers is the MOH’s Human Resources Unit (HRU). HFG has worked closely with the HRU to support the implementation of the country’s HRH Strategic Plan, and supported the MOH in developing the HRH component of the National Health Sector Strategic Plan. HFG also provided capacity development within the HRU on key HRH functions and worked with the HRU to strengthen human resource information systems for planning and management purposes. In 2014, HFG and the HRU produced the MOH’s first annual “Human Resources for Health Status Report.” The report used available data to clearly show where there was the greatest need for staff, which health facilities were largely nonfunctional due to staffing shortages, geographic areas with large numbers of vacant positions, and facilities that were overstaffed. This helped the HRU appeal for desperately needed positions, filling a backlog of 475 positions. HFG also worked with the Swaziland Nursing Council (SNC) to develop models for more effective regulatory oversight of the health sector. The SNC is responsible for ensuring the quality of the nursing workforce and works with the MOH to uphold practice standards, ensuring that nursing education meets service delivery demand. The SNC’s regulatory oversight has a direct impact on the quality of health services—including HIV and TB care and treatment. HFG and the Canadian Association of Schools of Nursing supported the SNC in developing entry-to-practice competencies for nurses and midwives. By strengthening the capacity of the SNC to regulate the nursing profession, and of nursing schools to train nurses using a curriculum which incorporates international best practices and local context, the new competencies help fill Swaziland’s gap in HIV/TB care. Within the social welfare (SW) sector, HFG supports the DSW to strengthen systems for the care of orphans and vulnerable children (OVC) and other vulnerable groups at a greater risk for contracting HIV. The sector is under severe strain as a result of the country’s high HIV burden. HFG’s SW activities focus on mitigating the impact of HIV/AIDS on vulnerable children and their families. To support child victims of violence in Lubombo, Swaziland—the country’s most impoverished region—HFG worked with the DSW to establish a child-friendly courtroom and trained court magistrates and intermediaries on handling such cases. HFG has worked to build the capacity of social workers in the Lubombo region to better serve the needs of their clients and increase number of clients served. HFG is working with the DSW to strengthen systems at the national level. Previously, case management was conducted using paper-based systems which made tracking and follow-up difficult. HFG is supporting the DSW to develop and migrate to an electronic case management system which will better meet social workers’ needs, strengthen case management and follow-up, and generate data for decision-making. In 2016, the DSW plans to greatly increase the number of social workers in the country. HFG support will include training social workers on the standards and practices of the DSW. HFG is also supporting the development of case management guidelines and a customer service charter to ensure that the department’s social workers provide consistent, high quality services. UNAIDS. Swaziland Country Fact Sheet.